Mauricio Pochettino might have presented Manchester City boss Pep Guardiola with an eye-opening lesson at White Hart Lane a few weeks ago, but when the former Barcelona manager visited the King Power stadium, he might have never imagined a colossal challenge awaiting him. Coming off a defeat against Antonio Conte’s Chelsea, a game where he was reminded of the fact that his tactics never had enough depth, another Italian manager, who created history last season with Leicester City, already knew what he had to do. Just 5 minutes into the game and the scoreline read 2-0, courtesy goals from Jamie Vardy and Andy King. Fifteen minutes later, Vardy made it 3-0, exposing a completely disorganized three-man Manchester City defence. The Englishman got the fourth of the night through a misplaced pass from John Stones before the visitors struck back late with two consolation goals through Aleksander Kolarov and Nolito. Overall, it was Leicester who came out on the top with some organized defending and blistering counter attacks on the run, showing qualities of why they deserved to be the winners last season. Zieler wasn’t really tested in the first half and shut danger out in a congested defensive area during the latter half before being beaten by a well taken Kolarov free-kick. The right back put up a decent show, showing a cool head in the back as the visitors enjoyed possession. Overall, it was a decent performance from the Englishman. Morgan had a big game in the center of defence and led his troops from the front. He used his physicality and resilience to silence the Manchester City frontline. The German defender kept Iheanacho in his pocket throughout the game along with having a hand in the second goal. Although the late goals might have given him a bitter taste, he showed absolute cohesion with Wes Morgan at the back, something that has been missing from him in the ongoing season. Undoubtedly, the best defender for the hosts with his offensive and defensive attributes on display. Fuchs contributed to the second goal before delivering Mahrez a sublime long ball, allowing him to set up the third goal. Showed no hesitation in absorbing danger at the back, as the visitors enjoyed a major chunk of possession. 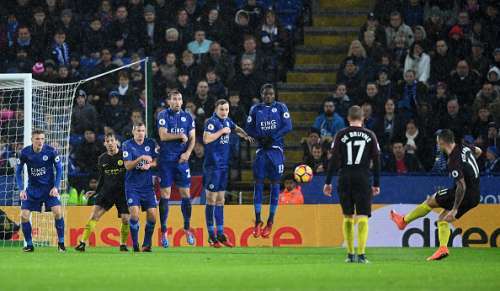 Albrighton was unfortunate not to get an assist to his name with a marvelous cross that Slimani missed out on but he was fortunate to escape the referee’s book after hand blocking De Bruyne’s shot inside the penalty box. Knew his role and committed to it, shielding the defence with his interceptions and tackles. He got the better of Gundogan in the middle of the park. King had no hassles in shifting from his defensive duties to contributing in his team’s build-up. He also got on the scoresheet with a well-taken goal from the edge of the area, something Bravo did not see forthcoming. Displayed why he was Leicester City’s best player last season with his link up on the pitch. From dribbling past players, to quick one-twos, to the magical touches, the Algerian was the glittering spark the defending champions needed. The Algerian put up his best show till date in a Foxes shirt, justifying their decision to break the bank for him in the transfer window. Slimani assisted the opening goal with a smooth pass along with testing the City defence with his high pressing. He could have gotten on the scoresheet but failed to head a beautifully served Albrighton cross. MAN OF THE MATCH. Vardy showed Pep Guardiola that he has the ability to deliver him nightmares like these apart from Lionel Messi. The Englishman was clever enough to take advantage of a three-man backline, leaving them exposed by his movements and his pace. What a way to break his goal drought! 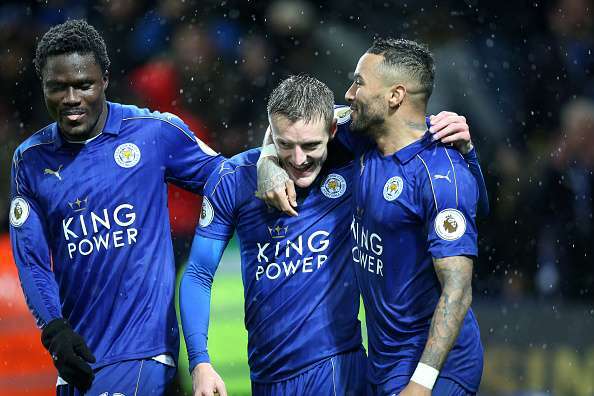 There was no pressure on him as Leicester secured hold of the game comfortably. The Japanese international continued to test the City backline with some high pressing along with counterpart Vardy. Bravo gave the opposition strikers an invitation to score, giving them the authority to press up high. The Chilean had another frustrating outing and is yet to deliver a performance that justifies he is the right candidate for the Citizens. Zabaleta was expected to provide City with width and bomb up and down the flanks, but he ultimately ended up leaving the right-back spot vacant and the defence exposed. He failed to track back well enough, displaying his lack of positional sense. Adjusted to the central defender role, in what was his second game, but was out paced and out muscled by the opposition frontline on many instances. While the youngster might have some lessons to take home from tonight, he won’t certainly want to get away with it soon. Looked shaky while playing up from the back and failed to keep a track on his English counterpart, Vardy, who bagged a hat-trick courtesy of his misplaced pass from the back. A disastrous outing for Stones. Kolarov had a torrid time at the back just like his team-mates, but contributed with an assist and a decent free kick which adds to his rating. It’s fair to say the Serbian lost his way as he directed many wrong passes along with shots off target. His performance was unable to fill the void of his Brazilian counterpart Fernandinho, as Leicester's counter attacks got the better of him. Sluggish in catching up to the tempo of the opposition team, the former Porto man failed to shield his defence effectively. Gundogan was unsuccessful in building up play, as the German had very little impact while trying to penetrate the Leicester defence. He had a quiet relatively quiet game, having already set the bar high in his previous outings. 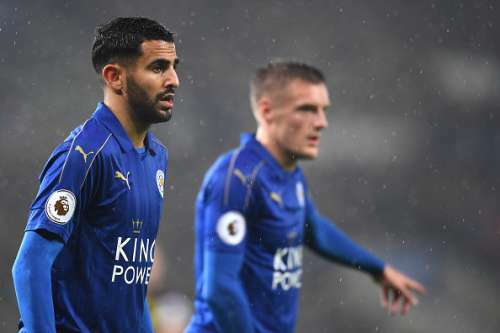 The Spaniard couldn’t make his way past Christian Fuchs or the other Leicester shirts, despite providing plenty of crosses in a cramped Leicester defence. Regardless of the attempts, the Spaniard’s final delivery in the box was never good enough to find the intended target. Was not the usual livewire in the Manchester City forefront, as he tried to get his side in the game. Made attempts to dance the opposition to his tune, but had no influence in attack. Controlled possession on the left as he tried to expose the defence to find openings, but was never successful. The Magician was present, but couldn’t wave his magic wand. The Nigerian was no match for the big men in central defence and failed to make the most of the given opportunity. He never seemed to get things going and wasn’t given any possible assistance by his teammates. The youngster could not provide the cutting edge his side needed, as he failed to find his way past a stubborn Leicester defence in the dying minutes of the match. Tried to build up play as soon as he got on, which Gundogan was unsuccessful with. Pep must be pleased with the dictation he had while in possession. The Spaniard has been in sublime form of late, recording a goal and an assist in City’s last match. Showed Guardiola why he needs to start with a calm finish to make it 4-2.